The availability of suspended sediments will be a dominant factor influencing the stability of tidal wetlands as sea levels rise. Watershed-derived sediments are a critical source of material supporting accretion in many tidal wetlands, and recent declines in wetland extent in several large river delta systems have been attributed in part to declines in sediment delivery. Little attention has been given, however, to changes in sediment supply outside of large river deltas. In this study, significant declines in suspended sediment concentrations (SSCs) over time were observed for 25 of 61 rivers examined that drain to the East and Gulf Coasts of the USA. Declines in fluvial SSC were significantly correlated with increasing water retention behind dams, indicating that human activities play a role in declining sediment delivery. There was a regional pattern to changes in fluvial sediment, and declines in SSCs were also significantly related to rates of relative sea level rise (RSLR) along the coast, such that wetlands experiencing greater RSLR also tend to be receiving less fluvial sediment. Tidal wetlands in the Mid-Atlantic, Mississippi River Delta, and Texas Gulf especially may become increasingly vulnerable due to rapid RSLR and reductions in sediment. These results also indicate that past rates of marsh accretion may not be indicative of potential future accretion due to changes in sediment availability. 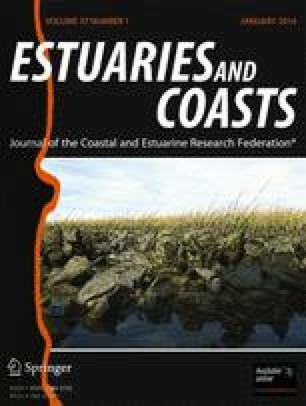 Declining watershed sediment delivery to the coastal zone will limit the ability of tidal marshes to keep pace with rising sea levels in some coastal systems. The online version of this article (doi: 10.1007/s12237-013-9654-8) contains supplementary material, which is available to authorized users. I thank Guillaume Turcotte for his assistance with GIS analysis, Craig Diziki for assistance with data analysis, and Steven Goldsmith, Simon Mudd, and Mark Stacey for constructive comments on the manuscript. I am grateful to the United States Geological Survey, the Permanent Service for Mean Sea Level, the Army Corps of Engineers, the U.S. Census Bureau, the U.S. Agricultural Census, the National Atlas, and the U.S. Department of Agriculture for collection and dissemination of data that makes studies of this nature possible (no endorsement of the data or conclusions is implied). This research was partially supported by National Science Foundation grant DEB-0919173 and by Villanova University. National Atlas. 2009. Major dams of the United States. http://www.nationalatlas.gov/mld/dams00x.html. Accessed 18 Oct 2009. Natural Resources Conservation Service, United States Department of Agriculture. U.S. General Soil Map (STATSGO2). http://soildatamart.nrcs.usda.gov. Accessed 1 Dec 2009. Permanent Service for Mean Sea Level (PSMSL). Tide Gauge Data. http://www.psmsl.org/data/obtaining/. Accessed 11 Jan 2012.